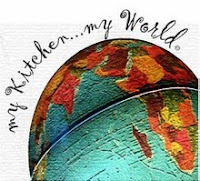 My Kitchen, My World is traveling to Germany this week, thanks to Roxanne of Roxanne's Road Rules. Our family hasn't had much luck finding German foods we like in the past. Something about the seasonings commonly used didn't really sit well with us. In fact, my aunt recently took a trip to Europe and during her week in Germany, she lived on apple dumplings the whole time! There is one German dish however that I dearly love. 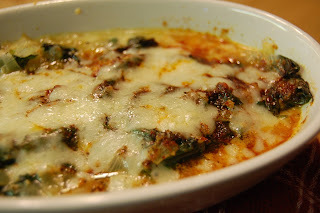 Not sure how authentic it really is but Uberbackener Spinat mit Kase (Baked spinach with cheese) is one of my favorite ways to eat spinach. It's a quick, easy recipe that packs a flavorful punch. This time I used regular Swiss cheese but in the past I've used Havarti, Gouda, Emmenthaler... pretty much any white cheese I've had around. Wash and clean spinach of sand. Dry. Cut spinach into strips. In a large Dutch oven, heat butter until bubbly. Add onion and garlic, saute for 2 to 3 minutes. Add spinach. Sprinkle with salt. Cover and steam for 5 minutes. Remove from heat. Grease an ovenproof casserole. Sprinkle half the cheese over the bottom of the casserole. Add the spinach. Sprinkle with paprika, nutmeg, and pepper. Top with remaining cheese. Bake at 360 degrees F about 20 minutes or until cheese bubbles. this looks great and isn't something I would expect from german cuisine- although I guess that is what this challenge is all about! However, I wouldn't really have a problem with living on apple dumplings for a week. those are good. Sound so delicious, and I think they really like dumpling, don't they? My favorite dumpling is the classic potato dumpling with a piece of crouton&bacon inside. But, I didn't make it (I was lazy and didn't really want to do a lot of grating the potatoes). I never would have thought of this. It looks good.